So I wanted something easy to cook the other night and I thought it would be nice if I could use the broccoli that came in our latest produce delivery. So what is easier than a casserole? Not much. 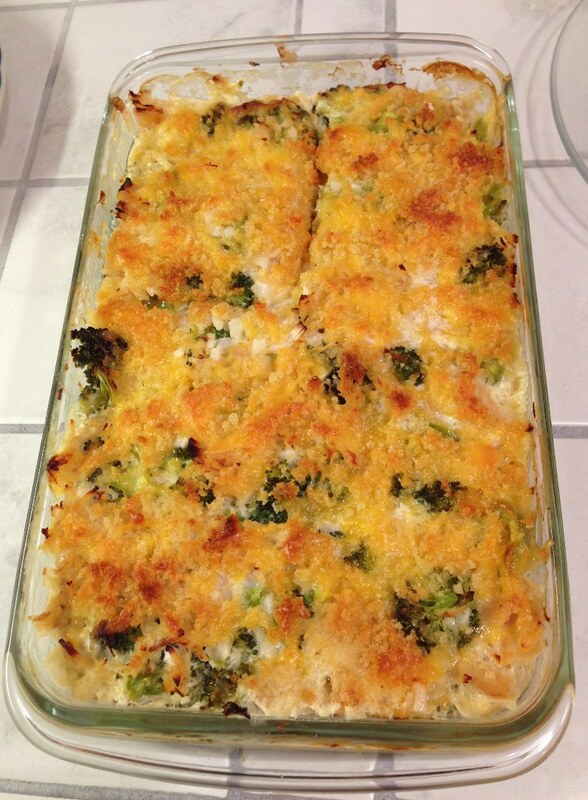 So why not a chicken, broccoli, and cheese casserole! So here is what I did, completely easy! Pour the milk into a large bowl. Then put in the flour. Whisk it together using either a whisk or just a fork. Get all the flour lumps out. Then add the chicken. Chop the onion and then add it to the bowl. Stir the milk mixture, the chicken, and the onion together. Then add the chopped broccoli. Add the garlic salt on top of the broccoli, then a couple of turns of a pepper grinder. (Or as much pepper as you like.) Then mix all the ingredients. Chop the bell pepper, then add it to the bowl, then add 2 cups of cheese. Then stir it all together. Grease a casserole dish (I used a 8 inch X 11 inch), then pour or scoop the mixture into the dish. Melt the butter and mix it with the panko bread crumbs. Then mix in the rest (1/4 cup) of the shredded cheese. 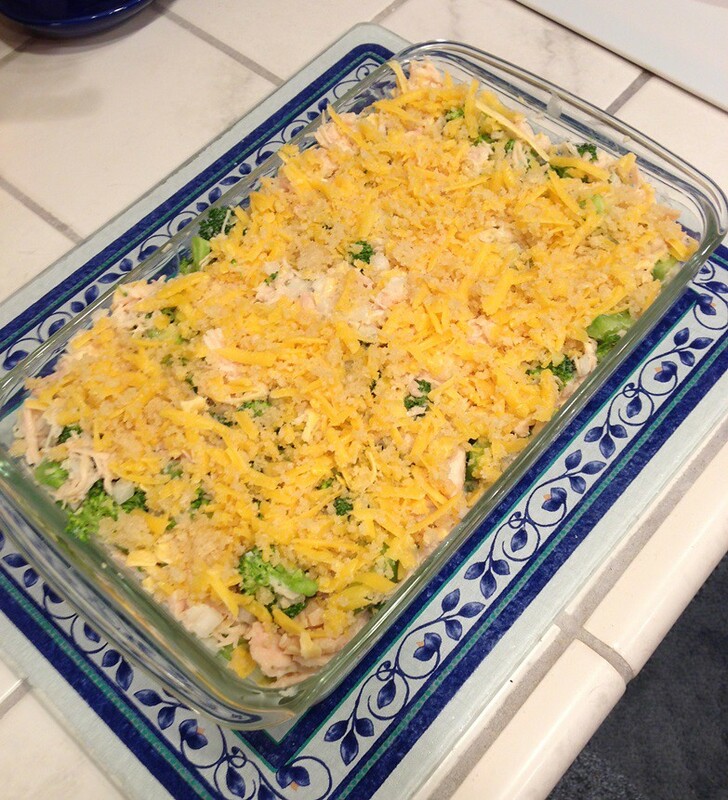 Sprinkle the butter, bread, cheese mixture over the chicken, broccoli, and cheese mixture. Then put the casserole dish in the oven and bake for 30 minutes. I was so intent on making the casserole, I didn’t make anything else. I think I would serve it over noodles. Or at least rice. But, as I said, I didn’t think about it. So we ended up using flour tortillas. We put the casserole in the tortilla one bite at a time. It was very good. While some people might cringe at using canned chicken, I don’t. 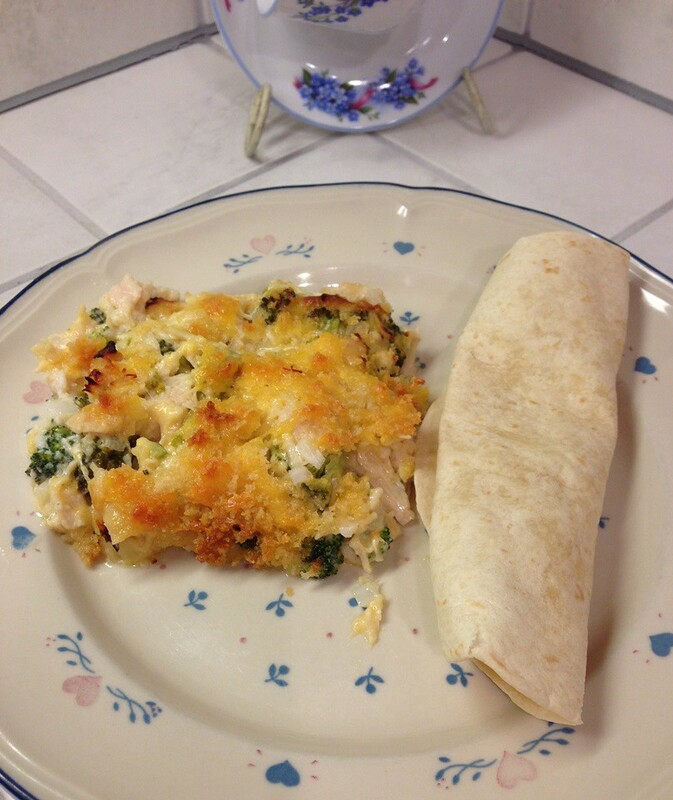 A long time ago my father-in-law made a yummy casserole and when he said he used canned chicken, I thought, “Well, it was damn good.” Now the brand you buy makes a big difference. We buy the Cocsto brand. Kirkland Signature™ Premium Chunk Chicken Breast. It is just big chunks of meat. We bought Swanson’s before and I think I ended up throwing it out. It was . . . . not big chunks of white meat. So I don’t trust any other kind. I am sure that three cups of cut up cooked chicken will work. But if you want to keep it really easy . . . use two cans. Oh, I just had a thought, I might not be able to get my husband to go along, but crusty french bread. This would be really good with crusty french bread. Yum. My hubby is not a french bread fan so I don’t usually think to serve things with bread, but this would be perfect with bread. What do you think? Sound easy enough? What would YOU serve it with?